The issue with Vindale Research is sorted so they should be paying me in a day or two. They just wanted proof of my identity and address to prove that I was a real person and not someone trying to scam them because I had earned a reasonable amount pretty quickly. 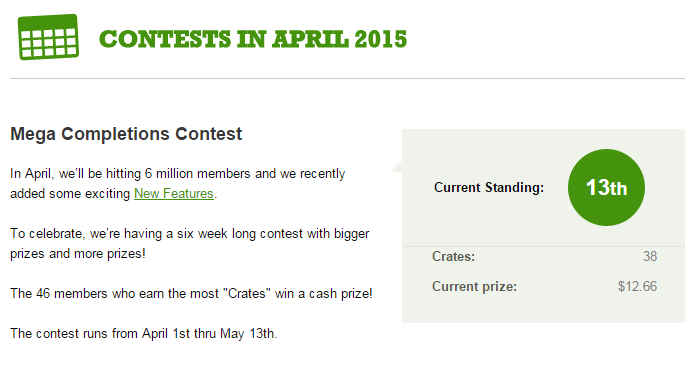 Cash Crate was my highest earner for the week due to the $10 payout for signing up with Swag Bucks. I also watched some videos on Prize Rebel whilst I was doing other things on the computer. Every few minutes I would just hit play on the next video and move on with whatever I was doing. I had my biggest offer for CashCrate today, under bonus offers there is one for $10 if you earn 525 points on Swag Bucks with their link. It took me a few days to earn the 525 points but I hit it tonight and an hour or so later the $10 showed up in my CashCrate Earnings. Why not sign up to CashCrate yourself and make $15 for doing $5 worth of surveys or check out my other tips on how to earn money at CashCrate. This week was a bit slow as I went away for Easter, the only website I really did too much on was Cash Crate due to their current competition. With just a few surveys on Spider Metrix, Opinion World and Vindale Research as well as some offers on Prize Rebel. I thought I would spend an hour this afternoon playing games on Cash Crate for money. I am not up to 38 crates which puts me in 13th position and standing to win $12.66. Want to see how I'm earning my crates?